Innovation has always been central to the story of Boston, a city as famous for its Redcoat-fighting colonists as its trailblazing scientists and inventors (lookin’ at you, Alexander Graham Bell). 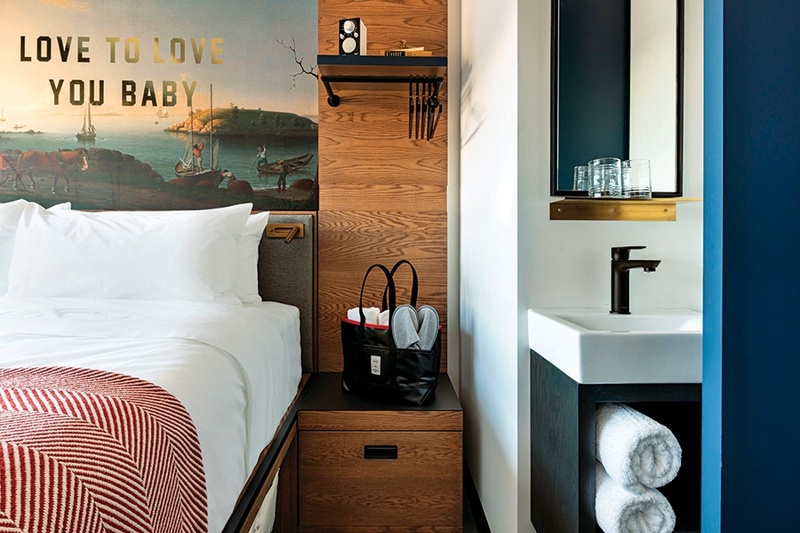 Aptly built inside the shell of a former YWCA building in the South End, the new Revolution Hotel—which welcomed its first guests in December 2018—aims to tell that tale through design. 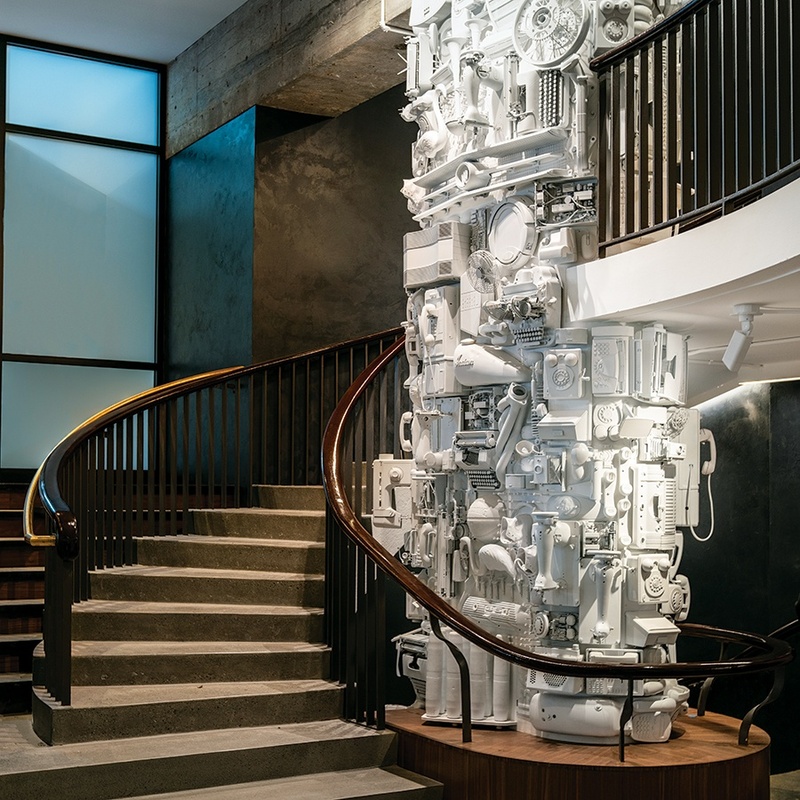 Ahead, see how architects from Cambridge-based Prellwitz Chilinski Associates (PCA) channeled Boston’s creative past into every corner of the posh space. 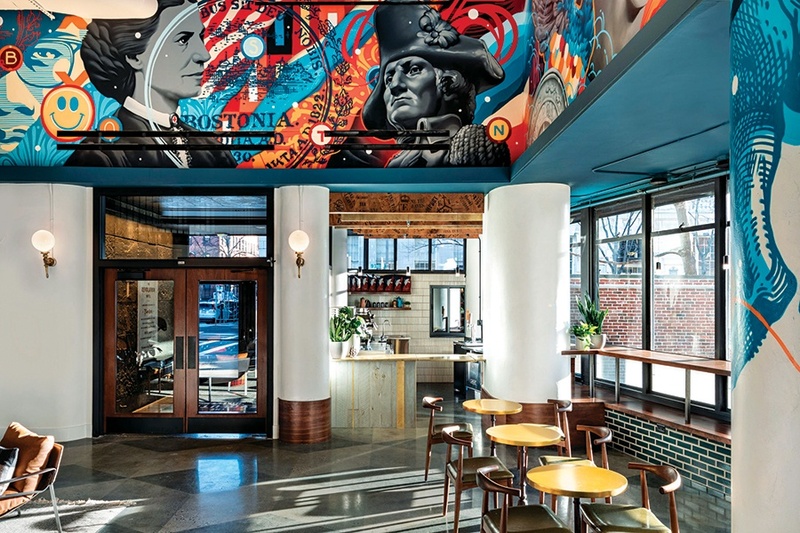 Spray-painted by L.A.-based artist Tristan Eaton, a 65-foot mural in the lobby (revamped with specially designed concrete flooring) celebrates notables from Boston’s history, including George Washington, Martin Luther King Jr., and John F. Kennedy. “[The piece helps] create a modern identity in a building that could have gone stuffy really quickly,” PCA architect David Snell says. A nod to the building’s midcentury roots, a neutral palette with pops of navy blue, red, and black lends cohesion to the décor throughout the hotel, which also features period-appropriate walnut woodwork and antique brass finishes. 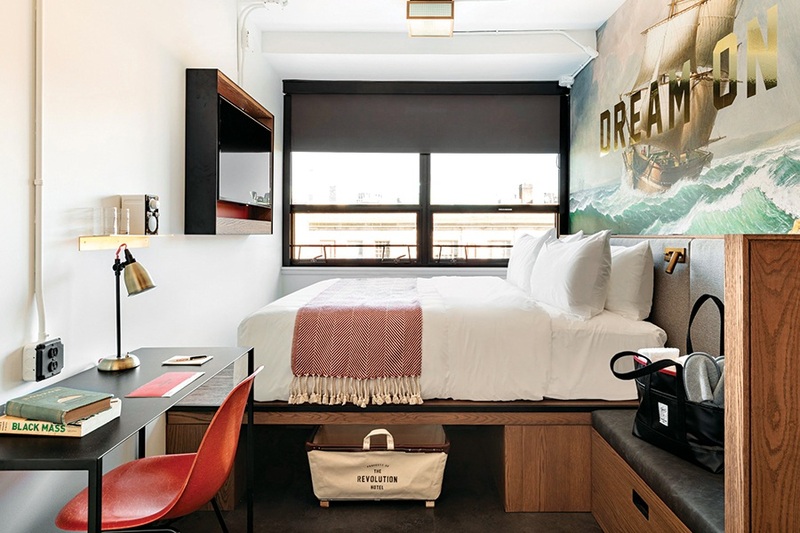 Limited space posed a significant challenge for the design team, who created the hotel’s sleek guest quarters in the footprint of the building’s former dorm rooms—some as small as 115 square feet. To make the most of every inch, designers furnished the rooms with wall-mounted shelves and platform beds, which provide hiding spots for custom storage totes from Chelsea-based Steele Canvas Basket. 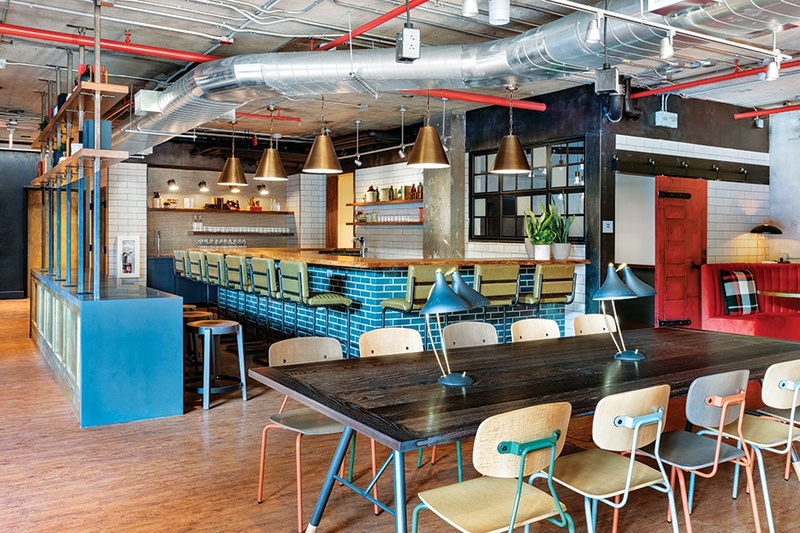 Designed to support the city’s next generation of innovators, the hotel’s basement-level coworking space features a bar topped with wood from an aged Back Bay elm tree. Dates representing important Boston milestones—including the legalization of gay marriage—dot the wood, customized by Connecticut-based Hancock Forest Products.